Here are some snazzy birthday facts about 17th of June 1967 that no one tells you about. Don’t wait a minute longer and jump in using the content links below. Average read time of 11 minutes. Enjoy! What day was my birthday Jun 17, 1967? June 17, 1967 was a Saturday and it was the 168th day of the year 1967. It was the 24th Saturday of that year. The next time you can reuse your old 1967 calendar will be in 2023. Both calendars will be exactly the same! This is assuming you are not interested in the dates for Easter and other irregular holidays that are based on a lunisolar calendar. What day is June 17 this year? There are 57 days left before your next birthday. You will be 52 years old when that day comes. There have been 18,936 days from the day you were born up to today. If you’ve been sleeping 8 hours daily since birth, then you have slept a total of 6,312 days or 17.28 years. You spent 33% of your life sleeping. Since night and day always follow each other, there were precisely 642 full moons after you were born up to this day. How many of them did you see? The next full moon that you can see will be on May 18 at 21:13:00 GMT – Saturday. Fun stat: Your first one billion seconds (1,000,000,000) happened sometime on February 23, 1999. If a dog named Gunther - a French Bulldog breed, was born on the same date as you then it will be 224 dog years old today. A dog’s first human year is equal to 15 dog years. Dogs age differently depending on breed and size. When you reach the age of 6 Gunther will be 40 dog years old. From that point forward a small-sized dog like Gunther will age 4 dog years for every human year. View the complete list of June 17 celebrity birthdays. Who are the famous June 17 birthdays? Here’s a short list of famous people in history who were born on Jun 17. View the complete list of June 17 famous birthdays. 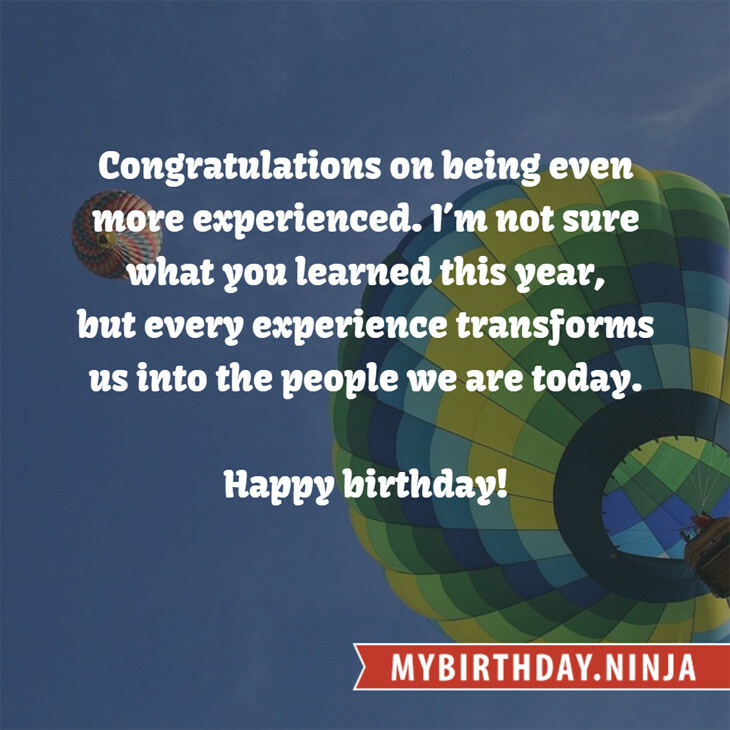 What happened on my birthday – Jun 17th? Vlad III the Impaler attempts to assassinate Mehmed II (The Night Attack) forcing him to retreat from Wallachia. Battle of Deptford Bridge: Forces under King Henry VII defeat troops led by Michael An Gof. In the Kingdom of Hawaii, Kamehameha III issues the edict of toleration which gives Roman Catholics the freedom to worship in the Hawaiian Islands. The Hawaii Catholic Church and the Cathedral of Our Lady of Peace are established as a result. The Wairau Affray, the first serious clash of arms between Māori and British settlers in the New Zealand Wars, takes place. American Indian Wars: Battle of White Bird Canyon: The Nez Perce defeat the U.S. Cavalry at White Bird Canyon in the Idaho Territory. Boxer Rebellion: Allied Western and Japanese forces capture the Taku Forts in Tianjin, China. The College Board introduces its first standardized test, the forerunner to the SAT. U.S. President Herbert Hoover signs the Smoot–Hawley Tariff Act into law. World War II: RMS Lancastria is attacked and sunk by the Luftwaffe near Saint-Nazaire, France. At least 3,000 are killed in Britain’s worst maritime disaster. A day after South Vietnamese President Ngô Đình Diệm announced the Joint Communiqué to end the Buddhist crisis, a riot involving around 2,000 people breaks out. One person is killed. View the complete list of June 17 historical events. Curious about this Wintergreen Mint? This is a party item you can activate and send to your friends when you play the free game Jump Birthday Party. It’s a fun and easy-to-play mobile game for all ages. Get free 1,000 gold coins when you download today! What does my birthday June 17, 1967 mean? Your birthday numbers 6, 17, and 1967 reveal that your Life Path number is 1. It represents initiative, potential and singularity. You are a born leader. You insist on your right to make up your own mind; you demand freedom of thought and action. The following celebrities also have the same life path number: Steve Hindalong, Jon Foreman, Susie Allanson, French Montana, Karen Gillan, Dana Reeve, Ron Randell, Earl Boen, Keith Whitley, Jean-Jacques Annaud. 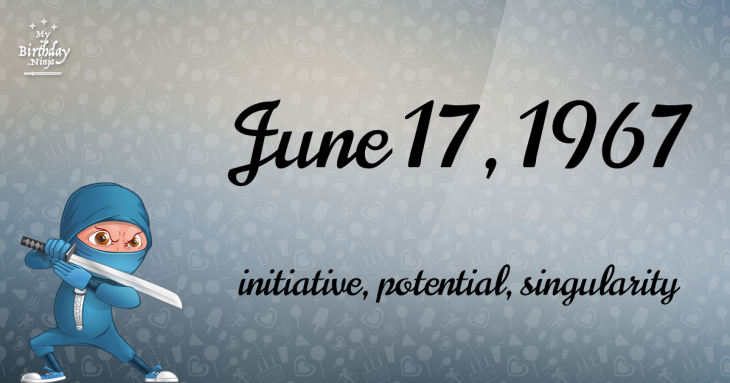 What is the birthday horoscope for Jun 17, 1967? The Western zodiac or sun sign of a person born on June 17 is Gemini ♊ (The Twins) – a mutable sign with Air as Western element. The ruling planet is Mercury – the planet of communication. According to the ancient art of Chinese astrology (or Eastern zodiac), Sheep is the mythical animal and Fire is the Eastern element of a person born on June 17, 1967. What is the birthstone for June 17? Pearl is the modern birthstone for the month of June while Moonstone is the mystical birth stone (based on Tibetan origin). The zodiac gemstone for Gemini is agate. Lastly, the birthday stone for the day of the week ‘Saturday’ is turquoise. Fun fact: The birth flower for 17th June 1967 is Rose for devotion. What is the Love Match for Jun 17, 1967? When it comes to love and relationship, you are most compatible with a person born on July 19, 1937. You have a Love Match compatibility score of +129. Imagine being in love with your soul mate. On the negative side, you are most incompatible with a person born on April 6, 1989. Your incompatibility score is -166. You’ll be like a cat and a dog on a love-hate relationship. Arf-arf, I want to bite you. Meow-meow, stay away from me! What is a good birthday trivia for June 17? The number-one hit song in the U.S. at the day of your birth was Groovin’ by The Young Rascals as compiled by Billboard Hot 100 (June 17, 1967). Ask your parents if they know this popular song. How many babies were born on June 17, 1967? Base on the data published by the United Nations Population Division, an estimated 119,222,142 babies were born throughout the world in the year 1967. The estimated number of babies born on 17th June 1967 is 326,636. That’s equivalent to 227 babies every minute. Try to imagine if all of them are crying at the same time. What is the popular baby name on 17 Jun 1967? What’s your bizarre Florida Man story? The #FloridaManChallenge is breaking the Internet and social media. Some crazy men, women, or creatures from the Sunshine State are making headlines every day of the year including your birthday. Try this fun exercise. Pick your search engine of choice and type in “florida man June 17” and see what kind of wild news headline you will get. This viral craze started in 2013 and gets resurrected now and then. The latest was from Tumblr and found its way to Twitter. As they say, the rest is history. Here’s a quick list of all the fun birthday facts about June 17, 1967. Celebrities, famous birthdays, historical events, and past life were excluded. Try another birth date of someone you know or try the birthday of these celebrities: April 7, 1915 – Billie Holiday, American singer-songwriter and actress (d. 1959); August 4, 1971 – Jeff Gordon, American race car driver and actor; October 8, 1941 – George Bellamy, English singer, guitarist, and producer (The Tornados).